About "Construction of pie chart"
Here, we take a circle and the whole circle is divided into sectors. The size of each sector is proportional to the activity or information it represents. 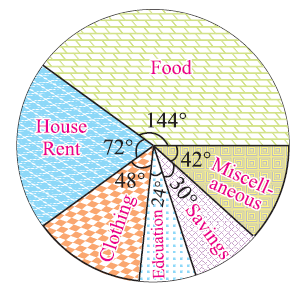 Since, the sectors resemble the slices of a pie, it is called a pie chart. 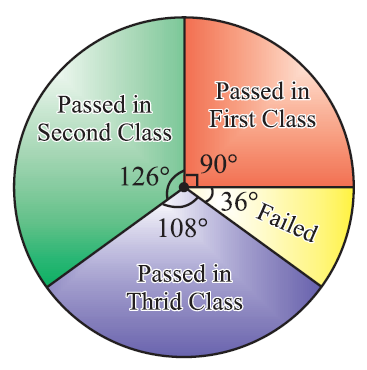 In a pie chart, the various observations or components are represented by the sectors of a circle and the whole circle represents the sum of the value of all the components .Clearly, the total angle of 360° at the center of the circle is divided according to the values of the components . 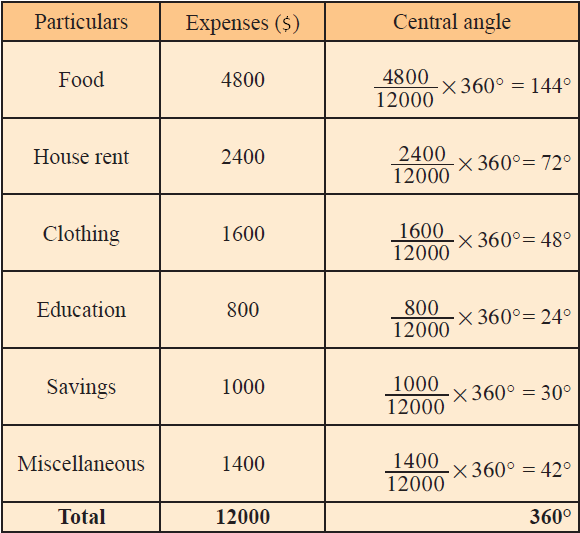 Calculate the central angle for each component , using the above formula. Draw a circle of convenient radius. Within this circle, draw a horizontal radius. Draw radius making central angle of first component with horizontal radius; this sector represents the first component. From this radius, draw next radius with central angle of second component; this sector represents second component and so on, until we exhaust all components. Shade each sector differently and mark the component it represents. Give the heading for each component. 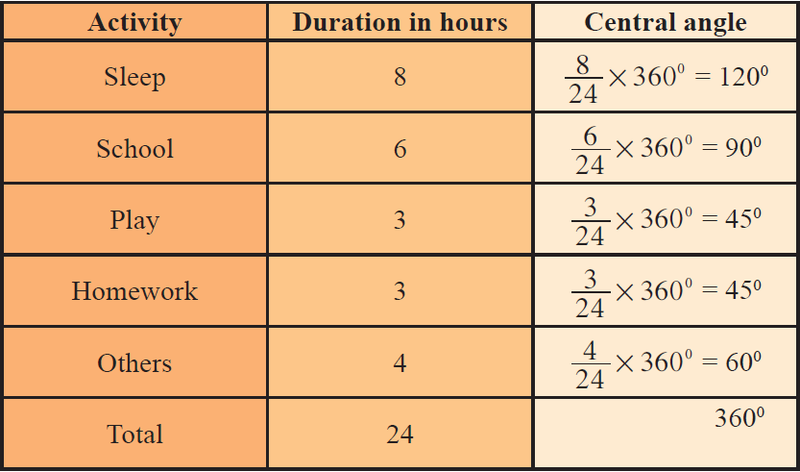 The number of hours spent by a school student on various activities on a working day, is given below. Construct a pie chart using the angle measurement. 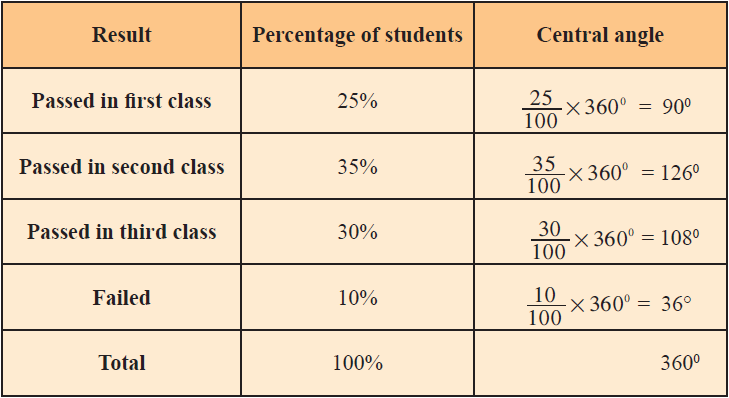 Draw a pie chart to represent the above information. 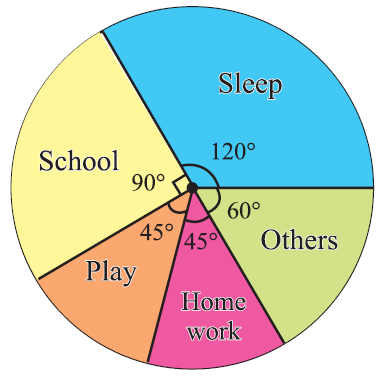 From the above table, clearly, we obtain the required pie chart as shown below. After having gone through the stuff given above, we hope that the students would have understood "Construction of pie-chart". Apart from the stuff given above, if you want to know more about "Construction of pie-chart", please click here.